Wire mesh, more planking and stones in lighthouse’s future - Anping Kingdelong Wiremesh Co.,Ltd. How we knit wire into mesh? WEST POINT – The president of the West Point Development Corporation says he believes some relatively simple repairs to a seawall will provide the necessary protection for the corporation’s West Point Lighthouse. Waves were washing almost to the lower level decks of the lighthouse inn on Saturday after extreme high tides eroded beach sand and allowed rock to wash out from under a large section of the lighthouse’s seawall protection. 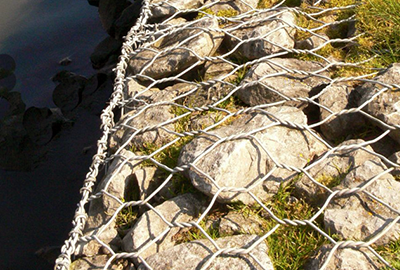 Harvey Stewart suggested adding planking to the exposed section of the wall’s support system, adding gabion basket wire and replacing the missing rocks will re-establish the protection. “It’s just a few extra planks, some wire and more rock and away we go again,” he assessed. “It saved the place for the last five years,” he said of the wall’s function. The West Point Development Corporation contracted Coastal Seawall Industries in 2011 to install a Langley Wall to protect its iconic structure. That came one year after a vicious storm ripped away the building’s natural protection, a sand dune out front. O’Leary-Inverness MLA Robert Henderson was out to view the erosion Monday morning and agreed with Stewart that last week’s damage can be repaired fairly easily. “It’s bad there was damage; good that the lighthouse wasn’t compromised,” he said. Henderson said he would work to help the Development Corporation get funding and environmental permits in hopes of getting repairs started soon.